Liverpool fans have had time to digest last night's shocking 2-0 Champions League defeat at the hands of Red Star Belgrade, and the Reds supporters are still questioning the performances of some of their players, as their chances of qualifying for the knockout stages of the European tournament suffered a major blow. A brace from Milan Pavkov handed Red Star a shock victory over last season's Champions League finalists, and frankly the entire Liverpool team that played in the Serbian debacle last night failed to deliver for their boss Jurgen Klopp. However, one player in particular suffered endless vitriolic comments on social media both last night and this morning as his display certainly didn't meet the expectancy of the passionate Reds supporters, and Adam Lallana will find it tough to get himself back amongst Klopp's plans for future Champions League matches. A stinging cyclone of negative comments swamped Twitter in the aftermath of Liverpool's defeat and the England international will not enjoy reading some of the views on his performance last night. Liverpool will need to forget last night's defeat quickly, but Reds fans can take some confidence in the fact that they face Premier League bottom club Fulham this weekend, so while their Champions League campaign has hit a significant bump in the road, their quest for Premier League glory should remain on course. 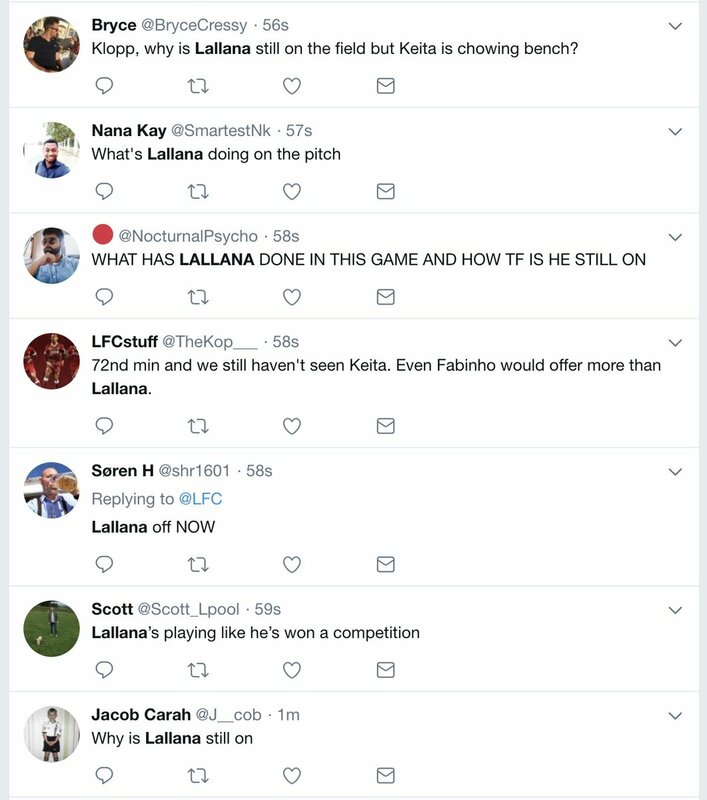 💻 🤔 "Wonder if Liverpool fans on Twitter rate Adam Lallana..."